Cute, fuzzy hamsters are defenseless little things that need your help to stay alive. While guinea pigs and rabbits can survive outdoors with the right setup, hamsters would have a much more difficult time. If you want your furry one to live a long, happy life, an indoor habitat is only the way to go -- for more reasons than one. Hamsters do well in temperatures of between 65 and 75 degrees Fahrenheit, according to the Humane Society of the United States. Since this is such a narrow range, outdoor living would be difficult if not impossible. Hamsters hibernate when temperatures get under 50 degrees Fahrenheit and might die if temperatures get near freezing. Heat is equally dangerous, especially if the cage is placed under direct sunlight. 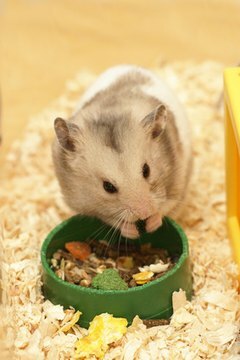 Because of these factors, it makes a lot more sense to keep your hamster indoors, where you can control the temperature and keep him away from drafty areas. Hamsters are prey animals. This means a lot of predators hunt them as food, including many city predators such as cats, coyotes and snakes. Even if you don't have snakes or coyotes around, the likelihood is that your hamsters will always be on the lookout for them and choose to spend his life hiding from potential predators. A life of hiding is a life of stress, so a hamster living outdoors will be constantly scared or expecting an attack -- not the most fun, satisfying way to live. A hamster living outdoors would be exposed to a number of diseases or health issues that an hamster living indoors wouldn't have to deal with. Ringworm and mite infestations are more likely to occur to hamsters kept outdoors, where they will come in contact with other animals who might be carrying the disease. Stress alone can result in digestive problems. Since outdoor living will be stressful, you're liable to end up with a very sick hamster. Hamsters are not equipped to survive in the wild. They are bred to live indoors, in cages, and would have a very difficult time fending for themselves if left loose. In fact, is unlikely that a pet hamster left loose would know how to find food. A warm cage in a safe, well-ventilated but not drafty indoor area is ideal for hamsters. Small Animal Channel: Will Pet Hamsters Released Into The Wild Survive?